(Newser) – California has joined the ranks of states that allow illegal immigrants to legally drive. "When a million people without their documents drive legally with respect to the state of California, the rest of this country will have to stand up and take notice," said Gov. 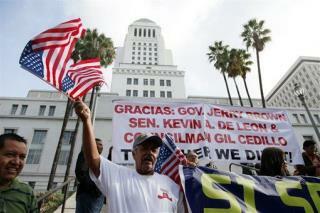 Jerry Brown at yesterday's signing, reports the Los Angeles Times. Some 1.4 million immigrants are likely to apply within three years; the state may set up six temporary issuing offices. They haven't done anything wrong, why deny them a license?